Featuring charming characters from the Mario and Dragon Quest series, Fortune Street seems like the perfect family party game, at least until you start to look past the colorful characters to the complexity of this Monopoly-flavored monster. I have to keep track of stocks? Can't I just pass Go and collect $200? I mean hell, just look at the screens below. If you have any idea what is going on there, you might be the one percent. Man, now I'm sad no one gave the game a 99, just to validate that reference. 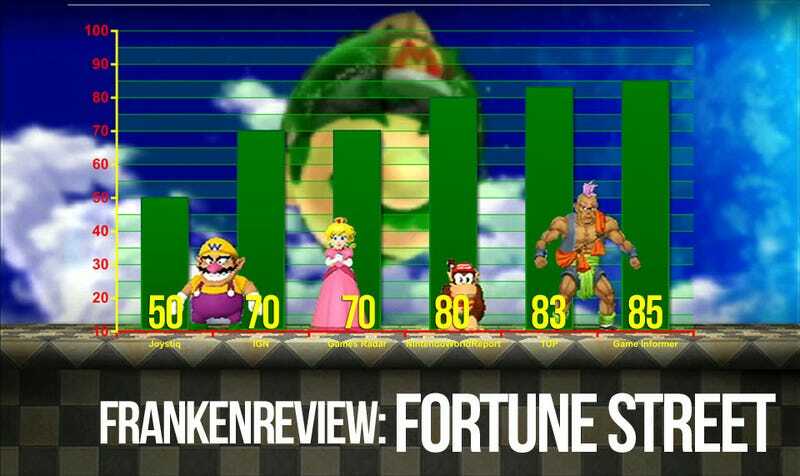 What did game reviewers give this dense slice of financial gaming pie once they got past their initial gut reactions? Let's take a look. Standard mode is a bit more involved. The basics are the same as easy mode, but it adds a stock market, so players can buy and sell stocks in various color-coded sections of the board called districts. Whenever you pass the bank, you can buy new stocks in any district, even if you don't own anything there. So even if you get screwed out of buying any property in a particular district, you can invest in stocks that give you a payout every time someone invests in that district or has to pay money after landing on a square in that district. The risky part is that you can also lose money on stocks – if one player sells off a bunch of stock at once, the stock price plummets and all other stock owners take a hit. The mix of risk and educated guessing goes a long way to make the game more exciting. All of this – collecting suits, buying and investing in property, and buying/selling stocks – adds up to a lot to juggle and manage, and it's what makes Fortune Street so satisfying to play. It really feels like a competition rather than a game of chance (although there were times when we cursed an unlucky roll of the die, for sure), so the rivalry between players feels very real, unlike most waggle-heavy or chance-based party games. Each game we played was always a tensely close race among players, especially since each player's investments constantly affect everyone else. Be warned; Fortune Street is not a game for casual play. It's not a party game in the sense that you can jump in and jump out for a quick minutes of fun. It's a game about making investments, and that begins with an investment of time. Again, it's very much an old-fashioned board game experience, the kind of thing you played with your grandparents long into the night before setting the board aside for the evening and resuming the next day. Heck, even that part of the experience carries over here: Fortune Street includes a "quick save" ability for those especially grueling sessions. Up to three games-in-progress can be saved, so you can switch back and forth between opponents both local and online. Note: Metacritic listed IGN's review score as 69, while IGN proper lists it at 70. Modified chart to reflect IGN score.